Many psychics have expanded their services to include psychic readings using text messaging. Customers find this a valuable service when they don't have time for a private conversation, but wish to talk with a psychic. iTunes Apple App and Google Play offer free downloads for Psychic Txt. 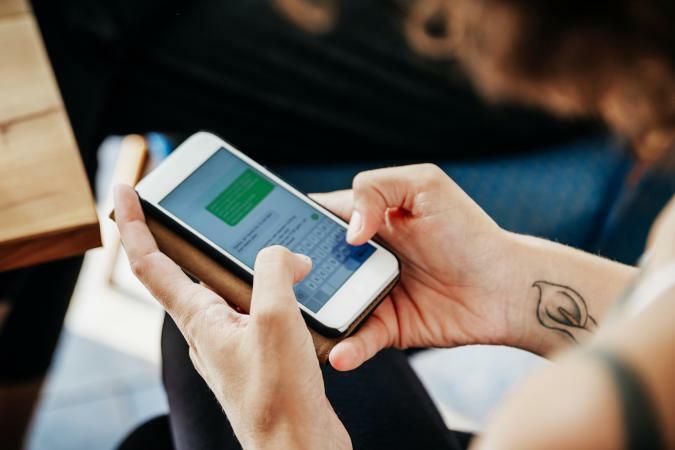 The app connects you with psychic readers via text messaging. Each of the ten psychic readers is skilled in three forms of readings. These include mediumship, tarot reading and/or palm reading. When you sign up, you receive free weekly horoscopes. You must give your gender and birthday to receive the readings. You can inquire about relationships, finances, career/job or your future as well as other issues concerning you. The website states that the psychics are handpicked professionals. "If you are a skeptic, try it out and wonderful things will unfold in your life and everyday events." "Amazing. Truly amazing did not have to say anything." "Definitely will be calling her in near future. Thanks!" Not everyone was pleased with their text readings, however, with some complaining that they were inaccurate. Lisa Paron offers psychic text readings. Payment: Pay via credit card or PayPal. Follow these steps for setting up a reading. You must complete and submit an online form and select either a 10-, 15-, 20- or 30-minute reading. Once you've submitted the form and payment, you'll receive an email confirmation within 24 to 48 hours with the time for the reading. You cannot carryover any of your session time. Texting can be done through Instant messaging, Facebook Messenger, Twitter or Instagram. Texting can also be conducted via phone, mobile, iPad, PC or laptop, iOS or Android device. Email readings are also available for more complex issues. "Amazing experience, I would highly recommend having Lisa Paron share her talent with you." "You will be blown away!" "...she answered a question about a job interview and was bang on." Ask Alexandra provides readings by text as well as by phone, email or chat. She writes that she receives her information from her twin sister who only survived four days. Though her sister survived only a short time, she's always shared a strong bond with her in spirit. Alexandra states she doesn't answer medical or legal questions, or predict lottery numbers. A different concept for text messages, Ask Alexandra offers different ways to get a live text message psychic reading. One-question readings with short response answers (15-20 words) are available for $9.99. Two-question readings with short responses are available for $16.99. If you have more questions, you can choose from the following. For these sessions, you can as many questions as you want. Unlike other psychic text readings, Alexandra doesn't place a limit on the number of questions you can ask within the allotted time frame. In addition to the reading, you also receive her free eBook in a PDF format, "Using Meditation to Unleash Your Psychic Abilities." Send Alexandra your phone number for the reading conversation. Provide a time on that day when you are available for the reading. At the designated time, Alexandra will text you at the number you provided. Longer readings are available via email. "Very good reading. Lots of information and detail." "Speed angel. Sweet and caring and so prompt with her readings. Luv her." "Worth every penny! Will be back." There are positives and negatives when it comes to a text reading. Many people compare this form of psychic reading to actual phone chats or FaceTime readings. Text message psychic readings can be very good for anyone too busy to chat on the phone. It's more private. A phone call conversation can be overheard while a text message prevents those nearby from eavesdropping. Some people prefer chatting with a psychic instead of what they feel is an impersonal form of communication about something so intimate. The tone of voice is difficult to mimic in texting, and subtitles can be lost. You may want to try a psychic reading via text messaging to see how it compares to a phone chat form of reading. You can try more than one service to see how other psychics fair using this form of communication.